Performance Improvement – Improve Consulting Group Inc.
A successful organization strives to be profitable for its owners and shareholders while meeting the needs and expectations of their customers. A business does not exist long without making money or having satisfied customers. Completing tasks faster creates opportunities to produce more products or services and spend less time on non-value add tasks. Focusing on quality of work results in fewer mistakes, defects, and/or waste, which in turn leads to less rework, returns, and customer complaints. Reducing costs related to production and/or operations means increasing profit margins. Any one of these three benefits can improve the bottom line for a business and create happy customers as long as it is not at the expense of the other two benefits, but seeking all three is at the heart of Operational Excellence. Whether your business is looking to improve a single product or process, or interested in continuously improving the way you do work, Improve Consulting Group can introduce the right tools and techniques to overcome your challenges and meet/exceed your customer’s expectations while increasing your profitability. 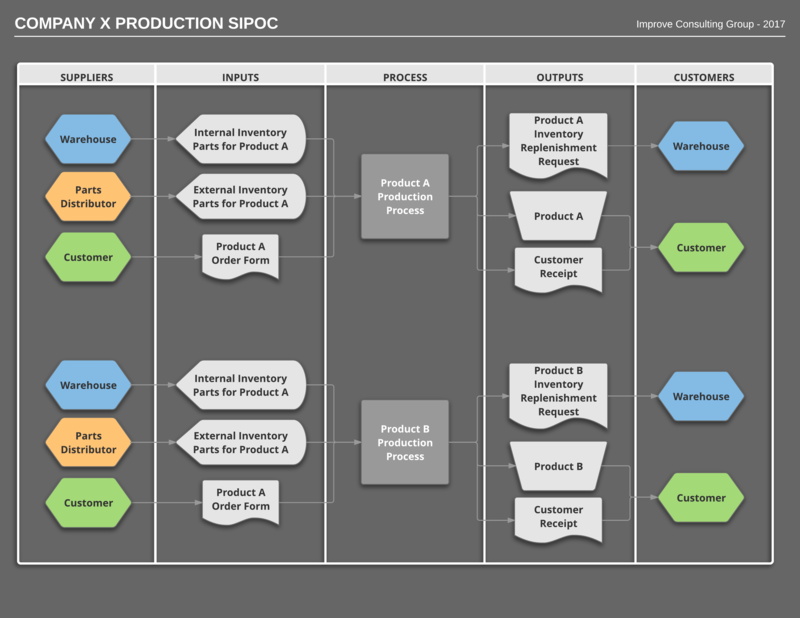 Flowcharts such as this SIPOC diagram (Suppliers, Inputs, Process, Outputs, and Customers) provide a visual overview of business processes.